The person dimension of place attachment refers to its individually or collectively determined meanings. The psychological dimension includes the affective, cognitive, and behavioral components of attachment. The place dimension emphasizes the place characteristics of attachment, including spatial level, specificity, and the prominence of social or physical elements. Recent literature offers several examples by researchers working with public citizens or coastal stakeholders to map values and place attachment as part of participatory GIS campaigns (Brown, Raymond, & Corcoran, 2015; Klain & Chan, 2012; Manfredo, Teel, & Henry, 2015). Allowing for more participatory and collaborative governance planning processes can increase trust between stakeholders and managers in shared-space contexts, as well as enhance perceptions of project legitimacy amongst coastal residents (Cliquet et al., 2010; Gilmour, Coffey & O’Toole, 2015). However, MSP scientists have identified a multitude of challenges associated with the establishment of successful participatory mapping initiatives. First, “meaning” and cultural values can be difficult to confine to particular spaces, and some coastal users resist the idea of defining hard boundaries between areas considered significant and others that are not (Gee et al., 2017). Similarly, some participants are reluctant to map cultural values at all (Klain & Chan, 2012). Furthermore, in multi-stakeholder studies, scientific actors view the participatory process as illegitimate in some cases, among other issues. In response, the participatory mapping software SolVES 3.0, programmed with the ability to map values without explicit locational information provided by stakeholders, is offered as a potential solution. This section will review the software, and two case studies in landscape values mapping, the first from Alaska, and the second from Japan’s Hokkaido Prefecture, focused around their relation to SolVES 3.0. A relatively recent technological development attempting to capture the spatial distribution of place attachment in a digital format, is the SolVES 3.0 software produced by the United States Geological Service (USGS). SolVES relies on a variety of previous socio-ecological science on social values in relation to natural environments to quantify and map connections over a predetermined study area (Sherrhouse & Semmens, 2015). One of the studies used to direct the software incorporates a place-based categorization of environmental values for the purposes of forest planning in Alaska (Brown, Reed, & Harris, 2002). In this case, the researchers designed a survey to collect data in twelve Alaskan towns, focusing on the relationship between quality of life and proximity to the Chugach National Forest, and other public lands. Survey participants were offered a hypothetical spending allotment of $100, of which they could spread across a choice of thirteen social values predetermined by the research team (Figure 1). Participants were then asked to plot these values and their hypothetical worth on a map of the research area in Alaska. For instance, a participant might take a fictional $10 and place it on a forested area near their home that they felt a spiritual connection to. They could then take another fictional $10 and place it on a different forested area that they most enjoyed for recreation. In this hypothetical scenario, both of these instrumental values (spiritual and recreational) are given equal weight by the participant ($10). The research team then aggregated the results, across all surveyed communities, to determine levels of place attachment in relation to distance from Chugach, and to define the most important social-forest values in Alaska, among other data points. Figure 1. 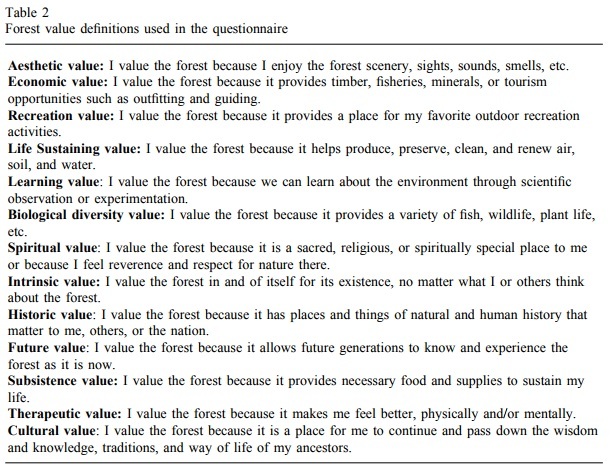 Social values used to test for place attachment in Alaskan communities near the Chugach National Forest (Brown et al., 2002). In results, the study suggested a “moderate support” for the idea that place attachment was indeed related to distance in this instance, but also concluded that just because certain forested areas were far away, they should not necessarily be considered valueless. The researchers found that place attachment was represented by a patchwork mosaic of varying social values across spatial and temporal scales, unique to each community and natural space. The results also found that a strong place attachment was an indicator of cohesive and tight-knit communities. Ultimately, the authors conclude that environmental management cannot be properly conducted without an understanding of place attachment within the designated project area. They suggest that their framework should not necessarily be replicated, but adapted for unique, place-specific methodologies in other management areas (Brown, Reed, & Harris, 2002). The USGS’s SolVES program attempts to capture this variability in spatial depictions of environmental value in a digital format. The software was designed as a tool to help users map and quantify social values of both spatial and non-spatial nature, overtop of “metrics characterizing the underlying environment, such as average distance to water and dominant landcover” (Sherrhouse & Semmens, 2015, pp. 3). The basic premise is to interpret the strength of present social values (strength-of-value is presented on a scale of 0-10) in relation to the environmental features present within the area of study (Sherrhouse & Semmens, 2015). In this case, values and their correlating spaces can be collected through written survey or hand-mapping, and then input by researchers, or collected directly from stakeholders via online survey and digital mapping through the software. Data collectors can also input their own physical features into software maps, and determine the values they wish to test – reflecting the call by Brown, Reed, & Harris (2002) to ensure that unique community or regional features are accounted for. Figure 2. 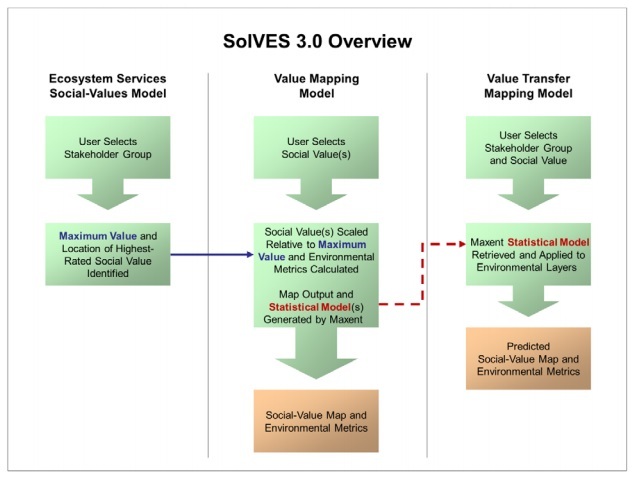 The SolVES 3.0 software’s process for building social value maps (Sherrhouse & Semmens, 2015). The USGS webpage that hosts the SolVES software, last updated April 20, 2017, shows a total of thirteen academic publications incorporating the tool, most of which involve the software’s founders. To date, none of these publications are focused explicitly on marine environments, although two socio-ecological watershed studies have been conducted, investigating the Datuan Watershed in Taiwan, and the Kushiro Watershed in northern Japan, respectively, each concentrating primarily on instrumental values encapsulated within ecosystem services frameworks. Figure 3. Valuating ecosystem services by location in Japan’s Kushiro Watershed. Warm-coloured clusters represent high values across distinct regions within the watershed (Shoyama & Yamagata, 2016). Amongst a number of findings, the researchers were able to determine that nature in the immediate vicinity of local residents was highly valued, and that the ability to access this localized nature played a significant role in the formulation of ecosystem values (Shoyama & Yamagata, 2016). Findings also suggested that the elevation at which residents within the study area lived was predictive of value scores in some cases. Residents near communities, and at lower elevations, tended to place a higher value on cultural and provisioning services than did residents at higher elevations in more remote locations. Several other sociocultural and economic factors were found to correlate with specific value types. 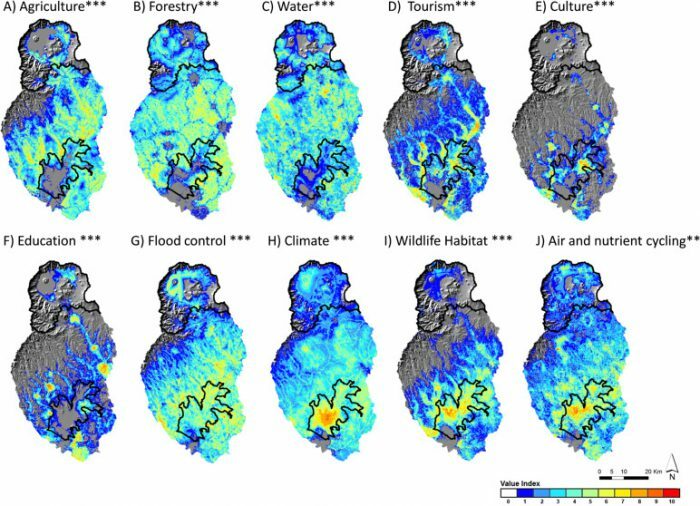 The Kushiro findings provide several insights into the relationship between demographic features of Tsusri and Shibecha residents in relation to environmental values that could potentially be adapted by land managers and watershed policymakers. For instance, results surrounding accessibility suggest that a public outreach program designed to assist residents in engaging with localized nature, might help to further conservation values among less-connected community members. However, in relation to the use of SolVES, the researchers suggest that additional consideration of psychological and sociological features is necessary for a robust understanding of the Kushiro Watershed and the community perceptions within (Shoyama & Yamagata, 2016). Ultimately, the SolVES software seems to have a significant conceptual potential for mapping place attachment. Early attempts have focused primarily on instrumental values, as well as cultural and intrinsic values as described by Shoyama and Yamagata (2016). However, as the software was originally developed in 2010, that it has only been incorporated into a total of thirteen studies to date suggests either that it is has not offered researchers the tool they desire for spatially-related work on environmental values, or that it has not been widely marketed. Furthermore, the SolVES user manual is not designed for non-GIS experts, and the maps produced by the software are not aesthetically pleasing, nor easy to read. Small, user-friendly design adjustments aimed to promote accessibility could significantly enhance the quality of the tool at present. This could potentially allow the non-GIS expert access to software, as well as offering other researchers and planners a more intuitive and enjoyable experience, perhaps helping to facilitate a greater use of the program. In conclusion, regardless of whether technology and computer programming prove capable of categorizing coastal place attachment, marine spatial planners and policymakers can help to organize and enable these shared conceptual investigations among stakeholders. Contemporary research suggests that retaining a recognition for unique cultural contexts and idiosyncrasies across communities and individuals may be the most important element of understanding place-based values (Brown, Reed, & Harris, 2002; Manfredo, Teel, & Henry, 2015; Shoyama & Yamagata, 2016). Today, with expanding populations and wealthy societies placing significant stressors on ocean habitats, the effective management of human behaviour in relation to marine environments is more important than ever. In marine spatial planning initiatives, policymakers can use this multiplicity of stakeholder values and ideas to continue to develop methods better-suited to place a true value on ocean spaces, reflecting the perceptions of those who live nearest – or perhaps of those who live within. Brown, G.G., Reed, P., and Harris, C.C. (2002). Testing a place-based theory for environmental evaluation—An Alaska case study: Applied Geography, v. 22, p. 49–76. framework. Journal of Environmental Psychology, 30(1), 1–10. Sherrouse, B.C., & Semmens, D.J. (2015). Social values for ecosystem services, version 3.0 (SolVES 3.0)—Documentation and user manual: U.S. Geological Survey Open-File Report 2015–1008, 65 p., https://dx.doi.org/10.3133/ofr20151008.